The best compost bin tumbler designs listed below are for making your own organic fertilizer for home gardening. Enjoy the many benefits of choose a composting tumbler for recycling your lawn clippings, yard debris and kitchen scraps! 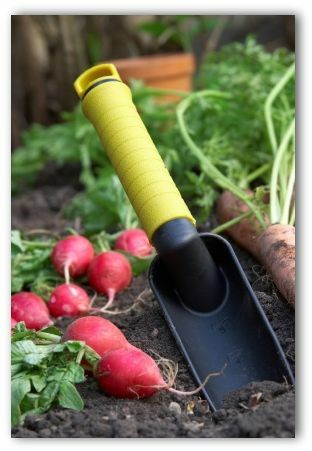 In the opinion of many avid gardeners, a composting tumbler is the way to go for making the valuable garden "gold" for your vegetables while remaining neatly tucked out of sight. Plastic compost tumblers look like ordinary trash bins and they are easily screened from view by a vine-covered trellis or a potting shed. A benefit to the tumbler being designed out of plastic is that it will not rust such as metal drums tend to do over time. The great part of using a tumbler is the efficient way it turns your recyclable materials such as grass clippings, yard debris, and kitchen scraps into a steady supply of organic matter without needing to use a gardening fork. The necessary requirement of turning the compost frequently to provide air circulation and moisture to all parts of the decomposing organics is taken care of by merely spinning the tumbler. As a bonus, at the base of the compost tumbler, liquids from the composting wastes are collected, which can serve as compost tea. The garden tonic can be drained directly from the bin into a bucket. Compost tea is full of essential nutrients and an excellent way to give your plants an added boost. 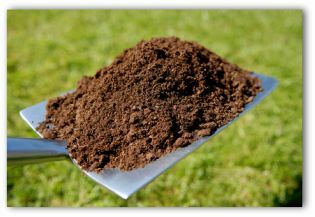 You want your garden soil to contain up to 50 percent compost and other soil amendments. For example, if you are digging a 10 inch bed, you would add up to a 5 inch deep layer of compost. Use the same rule of thumb as above when preparing planting holes. 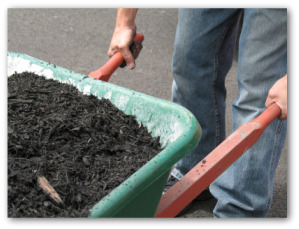 Dig out the soil, place it in a wheelbarrow, and mix it with the compost. Allow about 2 parts soil to 1 part amendment. Line the bottom of the hole with this rich mixture and back fill around the roots after your plants are set. 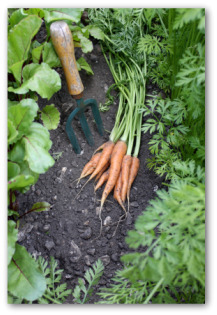 Compost is the best way to condition and improve your garden soil fertility. Toss leaves, twigs, banana peels, coffee grounds, tea leaves, egg shells, fruit and vegetable scraps, and other non-meat waste material into the tumbler to be transformed into soft humus which plants adore. Sawdust, weathered mulch material, lawn clippings, dry leaves, and wood chips are good soil amendments. However, while they are decomposing, they tend to tie up a lot of beneficial soil nutrients. Make sure these materials are aged-well before using them. Tumblers are generally equipped with rollers so the bins can be taken for a spin with ease and provide mobility for the bins. It typically takes a tumbler around 4-6 weeks to turn nature's garbage into vegetable gardening riches. Under ideal conditions, decomposition can take place in only 2-3 weeks. You can speed along the decomposition process by adding a little high-nitrogen organic fertilizer into the tumbler. 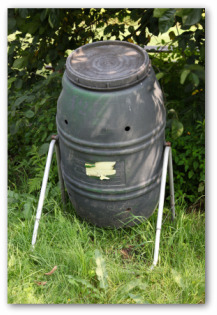 A back porch compost tumbler can be conveniently rolled from its hideaway spot on your porch to the exact location where you will be using the finished product. Then simply remove the black gold from the tumbler to be worked into the beds. Although, the average compost bin tumbler can adequately decompose organic wastes produced by the average sized family, many gardeners prefer to keep two or more tumblers to ensure having ready compost on hand. A compost bin tumbler can turn garden and kitchen waste into soil amendments for providing the garden with the most fertile and well-balanced soil to grow your vegetables. The tumblers are sold commercially at most garden centers, or can be ordered online. You can also help the environment in turn by purchasing a compost bin tumbler that is made from recycled plastics.